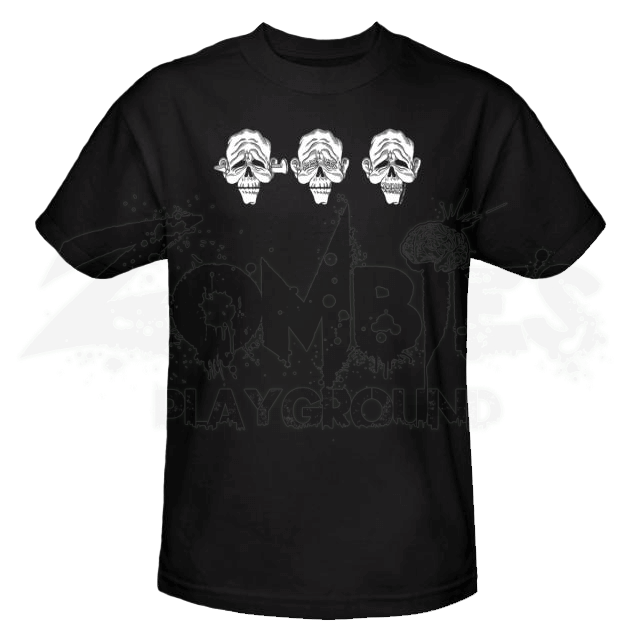 The Three Dead Zombies T-Shirt is a modern, zombified take on the age-old three wise monkeys concept. Just as the three wise monkeys cover their ears, eyes, and mouth, these three zombie heads are rendered deaf, blind, and mute. This black and white t-shirt is made from quality cotton to ensure that it is simple in appearance and yet thoroughly comfortable to wear. The shirt features three stylized zombie heads, each of which mimics one of the three wise monkeys from the classic maxim. The first head has a rail spike that has been driven through its ears, rendering it deaf and thus, hear no evil. The second zombie head has had its eyes sealed shut via stitching, rendering it blind and thus, see no evil. The third zombie head has had its mouth sewn shut, rendering it mute and thus, speak no evil. Each of the heads is rendered in white, with black lines as detailing. The shirt is made from 100% cotton and is a standard fitting adult t-shirt. 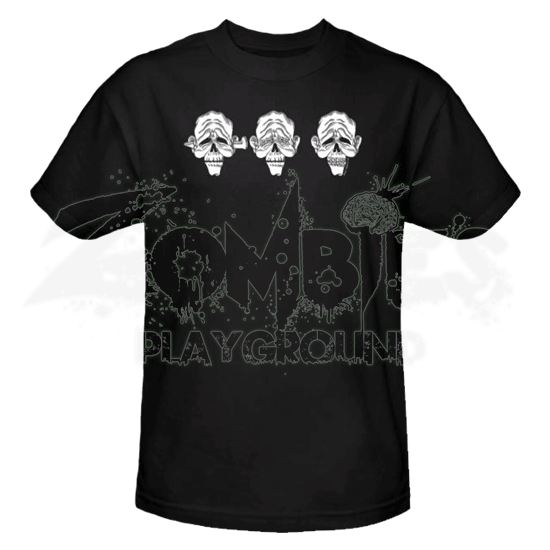 Now you can display the principles of hear no evil, see no evil, and speak no evil and keep the concept alive with your own zombie style, whenever you wear the simple, comfortable, and stylish Three Dead Zombies T-Shirt.